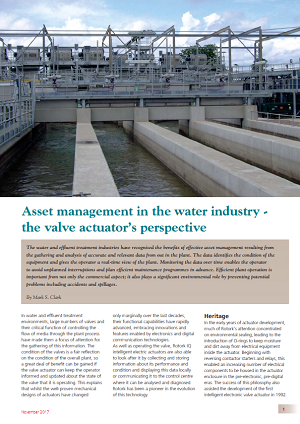 The water and effluent treatment industries have recognised the benefits of effective asset management resulting from the gathering and analysis of accurate and relevant data from out in the plant. The data identifies the condition of the equipment and gives the operator a real-time view of the plant. Monitoring the data over time enables the operator to avoid unplanned interruptions and plan efficient maintenance programmes in advance. Efficient plant operation is important from not only the commercial aspect; it also plays a significant environmental role by preventing potential problems including accidents and spillages.